Green roots stir from their slumber of snow. The sun touches the trees and fills them with hope and promise. Yes, spring has finally arrived! A new season means new life in the corners of Cuckooland, and the pending due date of your own new arrival! As the frosts thaw and you prepare for your bundle of joy, feel inspired by the seasons when decorating your little wonder’s room. We’ve put together a handy guide that will help you celebrate springtime in your baby’s nursery, guaranteed to brighten the days of your precious little munchkin as you welcome him or her into the world. When you think of spring the imagination tends to stretch towards tall, luscious trees and walking through a forest with the leaves stretched high above you. 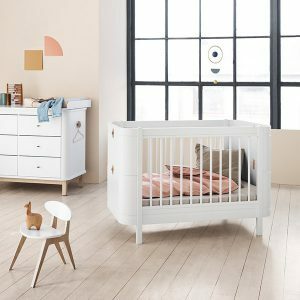 The warm embrace of Mother Nature can calm even the crankiest tot, so bestow a little natural charm on your nursery with safe and sturdy wood-based furniture. The Oliver Furniture Wood Mini 4 in 1 cot bed is a simple and homely cotbed that grows with your little one. 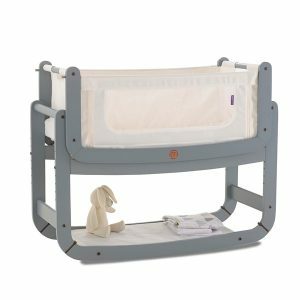 The elegant design leaves room for all sorts of style combinations, whilst the cot’s adaptable structure will blossom with your baby at every stage of their development. Bring your nursery to life with fresh, vibrant colours that capture the spirit of your spring theme. A few hints of green will give your little wonder’s room a splash of colour. This underrated colour is perfect for setting a unisex colour scheme. So if you’re waiting for the stork to bring you a surprise instead of finding out babies gender, you can’t go wrong with green. 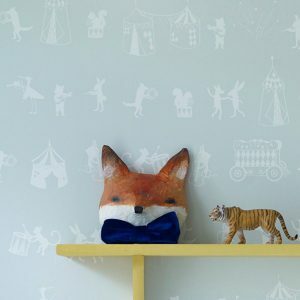 We love the Animal Parade Wallpaper from Hibou Home; bathed in a cool mint green with quirky animal figures dancing and playing music, it’s guaranteed to give a light and open feeling to even the smallest of spaces. Sleep is so important to your tyke, so make sure every naptime leaves them feeling as fresh as a brilliant ray of morning sun. Gently cajole your munchkin to sleep with an activity gym that will bring the outdoors in. The Percy Pup Multi Activity Play Gym is a fun and playful headrest that will certainly send them off in gurgling delight. 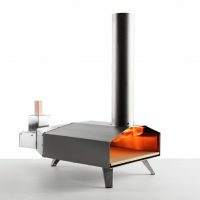 With a captivating array of mirrors and materials to divert attention in the waking hours, it’s a must-have accessory for rest and play. There’s an art to keeping your spring miracle entertained, so introduce some seasonal toys into baby’s inventory that are bound to leave a smile on your little one’s face. Find animal friends who bring to life the joys of Spring with the Neo Wood Activity Bead Frame Toy. 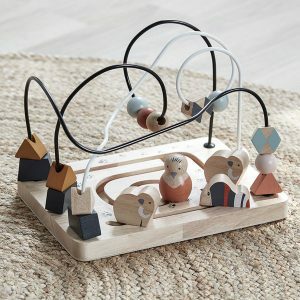 Or let your bouncing baby indulge their budding senses with the musical whimsy of a toy xylophone. 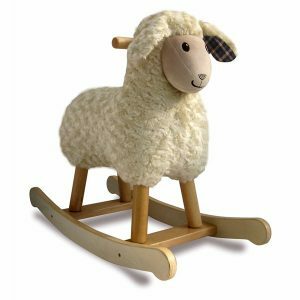 As your spring chicken begins to find their feet, teach your tot the art of balance with the Lambert Infant Rocker. This gorgeous, fluffy animal design is just waiting to be baby’s newest woolly friend and will be the focus of months of happy memories as your baby blossoms before your eyes. So there you have it, friends – everything you need to create a spring themed nursery with bundles of charm. Birth, children, newness . . . this is at the core of what makes spring so special. 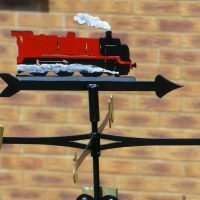 Kitting a room out with these enchanting items will glue the magic of the season to your baby’s earliest memories, giving them the best start in life as you welcome them into the world. Need a little more inspiration for your nursery? 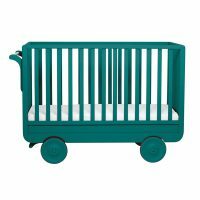 Browse our full Nursery collection to get started. Our Nursery specialist team is always on standby to answer any questions you may have – simply call us on +44 (0) 1305 231231 Mon-Fri 9-6pm or email customerservice@cuckooland.com and our super friendly team will reply immediately. Next PostCreate Your Own Cosy Igloo Retreat! 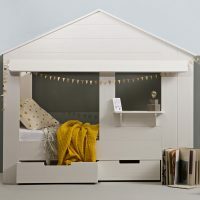 The Most Amazing Kids Cabin Beds Ever Made!